Developing great care and support plans is about ensuring that the person is active in the process of planning, rather than someone having the planning ‘done to’ them. 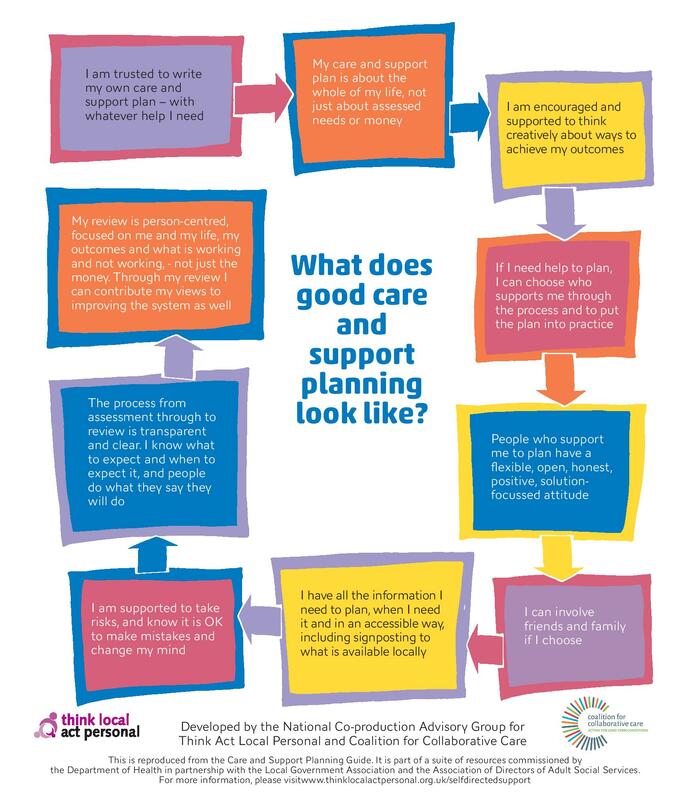 Depending upon the complexity of a person’s long-term condition or conditions, the process of care and support planning may range from a simple conversation which is recorded in their notes to a more detailed care and support plan that helps the person coordinate any support they may have. For example, for a person with relatively stable diabetes who sees their GP every 6 months, their care and support planning may be a conversation where they set some health outcomes related to better managing their diabetes, and these are recorded in their notes. However, if the person has a more complex long-term condition or multiple conditions, they may need a more detailed care plan that provides a point of coordination for the support they receive. The key is having a conversation that treats the person’s knowledge about the impact of their condition as equal to that of the practitioner. The person is the expert on how they experience their health condition and it is really important that the care plan reflects this. The plan needs to reflect not only what it is important to address for the person’s health, but also what matters to them about their life. So often, care planning excludes this very significant part of a person’s life. One way to understand this is to use person-centred approaches, including one-page profiles. Here is a blog describing some person-centred approaches that can help. So often as health practitioners, we are quick to offer a solution to the person’s problems as we see them – without having a true understanding of the person’s specific situation. I call this the ‘fix it’ habit. Using the person-centred thinking tool working/not working can help you do this differently. It helps us to fully understand the person’s situation and identify issues that the person may want to address because they are relevant to them. Once we know what the issues are, we can make sure that the care plan includes health outcomes that address these issues in a person-centred way. Exploring what is important to the person in relation to the issue means that the person is much more likely to feel connected to their health outcomes and more likely to achieve them.